When it comes to choosing the perfect fence for you home, you have a lot of choices, ranging from wood to aluminum to vinyl, each with its own set of pros and cons. Over the next several weeks, we will help shed some light on a few of the most popular fences on the market today. This week, we will start with the Pros and Cons of Vinyl Fences. When it comes to residential fences in not only Northern Virginia, but all across America, vinyl has soared in popularity since its inception, offering homeowners a durable and cost-effective alternative to wood and chain link. But is vinyl the right choice for you, your home, and your budget? Vinyl fences are extremely durable and tend to last longer than wood. It will never rust, decompose, or splinter. Vinyl fences are also close to five times stronger than wood. Vinyl is an incredibly low maintenance material and never requires painting or staining to maintain its visual appeal. These fences are also incredibly easy to clean, typically requiring only soap and water. A power washer can often be used for tougher cleaning jobs. Vinyl is flexible so it will not break easily in high winds. Vinyl fences are typically more expensive than wood or chain link. Vinyl fences are not as easily repaired by the average homeowner. Repairs may need to be done by a professional. Unlike wood, vinyl is not easily painted. Overall, the pros outweigh the cons. Vinyl is a great, long lasting, low maintenance option for any homeowner. But check back next week as we examine the Pros and Cons of Wood Fences. 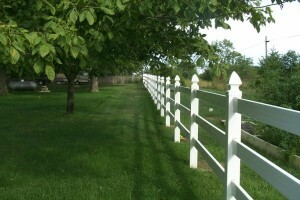 Hercules Fence has been providing professional fence services and installation throughout Northern Virginia since 1955. We can handle all of your residential fencing needs, from Custom Wood Fences to Ornamental Steel Fences to Ornamental Aluminum Fences to PVC Vinyl Fences to Chain Link Fences and more. We take great pride in our work. So why would you call anyone else. If you have any questions about our blog, “The Pros and Cons of Vinyl Fences” please contact Hercules Fence of Manassas, Virginia today by calling (703)551-2609 or visiting our website. Also, check out Hercules Fence of Manassas on Facebook,Twitter, Google+ and YouTube! This entry was posted on Thursday, January 23rd, 2014 at 6:08 pm. Both comments and pings are currently closed.